Copywriting is an important part of any marketing campaign. Though the job has changed as the advertising world, there has always been a need for good copywriters in any advertising agency. Some of the best copywriters in the world probably never got the attention that they deserved, and some of the most famous advertisers probably could not write copy strong enough to sell a thing. It’s a talent that some people are born with, but it never hurts to get some tips along the way. There are many areas of copywriting worth talking about, which is why I will continue to write a series of blog posts on the subject. But today’s focus is on readability. Last week on ProBlogger, the best blog about blogging out there, Darren Rowse wrote a post about readability. In it, he references facts that made me think about copywriting in a way I’d never thought of before. It seems that in the digital space, the lower the reading level, the more likely something is to be shared. And in reality, if you’re marketing to the masses, you might be missing out on a large percentage of the marketing if your copy is too “hard to read”. The copy in your emails, banner ads, search ads, and on your website and landing pages needs to be simple and strong. Simple, to make it easy to read. Don’t use 10 words when 3 will do. Short sentences, short paragraphs, bolding and underlining to highlight certain point will make anything you write easier to read. And something that is easier to read is more likely to be read. Strong, to make the message stick. Use compelling headlines, numbers, statistics, and calls to action in order to get the attention of your reader. Once you have their attention, move them through your copy line by line. Finish as strong or stronger than you began because when they are done reading, you want them to take the next step. I am not telling you to “dumb down” the wording that you use in ads and emails. What I am telling you to do is re-evaluate it, and make sure you are writing to your target audience. Just because you would read something does not mean the consumers will. ​Zach Heller Marketing is all about perfecting the way you and your company communicate with consumers in the digital age. Our specialties include email marketing, social media marketing, direct mail, and website design and development. Hey there! My name is Zach Heller. My goal is to create a place of open communication about marketing, advertising, small business, etc. I invite comments, emails, and connections of any kind. You can connect with me anytime. 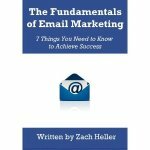 Get "The Fundamentals of Email Marketing: 7 Things You Need to Know to Achieve Success" today! Copyright 2018, Zach Heller Marketing. All rights reserved. Read all of my marketing tips and tricks here.